Try Continuous Ink System with your Brother DCP-330C and make 30 times more quality prints for the same money! Pay only 0.04 USD for A-4 full color print! Continuous Ink Supply System CISS dcp-330c is inkjet printers' optional equipment, which is installed directly to printing box instead of standard cartridges. Furthermore, it cuts consumables costs in an appreciable way. 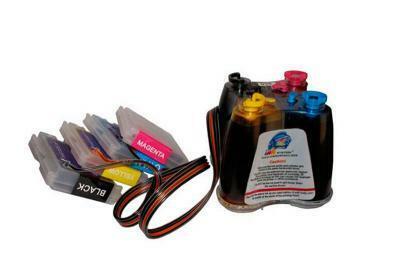 This type of ink supply system perfectly does for photos and texts huge volumes printing and it is value-for-money. System can be used almost for all models of inkjet printers with printing head plugged in, because the asset of printing head is practically limitless. The best part of inkjet printer Brother's models satisfies these conditions, CISS similar models CISS for brother dcp-350c and CISS for brother dcp-385c are proper too. If you are using CISS brother dcp-330c you can get higher stability in printing, because there is no necessity for pulling out the cartridge to fill it up or nulling the chip, the latter in their turn are the main reasons of the problem created by the air getting into the printing head or ink leaking. Once you install and fill it up, the only thing remains is to add some more ink into donor reservoir. And the most important thing is that owing CISS ink system brother dcp-330c you are reaching maximum economy, because there is no necessity in buying of expensive cartridges. Donor reservoirs have ink quantity 5 times more than cartridges, and their price is deep in the money. Moreover, the use of compatible paper for inkjet printing makes it possible to minimize the consumables costs. Detailed instruction allows you to make the installation of continuous ink system brother dcp-330c alone and with minimum time consumption.